I’ve been trying to find a way out.Now I think I have ,if my dream comes true. I’ll finally get to meet the prize patrol team….all things happen for a reason ….. Publisher Ckearing House Sweepstakes $2,600,000.00 Plus More #8800 Plus $5,000.00 Weekly with the extra bonuses would be a dream come true. Looking forward to December 22-2017 to meeting you and receiving the check and meeting all of you live on TV. My comments are always awaiting for moderation…. Hi, PCH. I would be so honored and blessed to win any of your prizes! God is good and He knows how much I deserve it and need it. Some months ago I received a PCH check for $10 together with a VIP Elite card for $5,000 bonus in case I won a big price…Someone asked me if I was going to go to the bank for such a small amount, I didn’t care and did it…I keep those $10 in my wallet. I know that someday I’ll get a big price. Thanks for the opportunity and for keeping my dreams alive. I WOULD LIKE TO WIN THE TURN BACK TIME PRIZE FOR NUMBER GWY 8800, $2,6 MILLION PLUS $ 5,000.00 A WEEK FOR LIFE, IT’S NICE TO TURN BACK THIS PRIZE, BUT NOT MY AGE LOL.THANK YOU FOR THE GREAT GAMES I PLAY IT SURE PASSES THE TIME , AND I SURE ENJOY THEM, THANK YOU AGAIN PCH. PCH gwy #8800, I have completed the Certified Contest Seal 11/30/17. I want to win PCH gwy #8800, $2,600.000.00 plus $5,000.00 a week for life. $5,OOO.OO A WEEK FOR LIFE AT STAKE! $2,6OO,OOO.OO At Once + $5,OOO.OO A Week For Life! I, Roy Appel, would like to see MY NAME appear on a Publishers Clearing House Winner’s Agreement! I am entering by the deadline and claiming full eligibility to soon Win $2,6OO,OOO.OO At Once Plus $5,OOO.OO A Week For Life on 12/22 with the forthcoming Prize Number to be issued to me! To affirm this statement, transfer the seal below! Yes I want to win the GWY 8800,$2.6 Million plus $5,000.00 a week for life. It would mean a lot to me to win this. Thank You PCH! 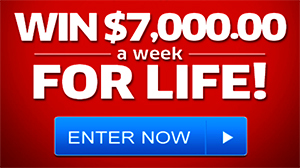 Yes I want TO WIN $2.6 MILLION PLUS $5,000.00 A WEEK FOR LIFE ON Dec. 22nd. It would be the greatest blessing for me ever. Thank You PCH! Declaration of intent._ PCH FrontPage Search & Win Prize Patrol please activate my entry I want to Prize of Lifetime $2.600.000.00 up front plus $5.000 a week for Life. * I Jacqueline Aramayo Declare my intent to go for a Prize of a Lifetime, understanding I could win a Big on December 22nd. * Furthermore, my Prize Event , prize entry is to be processed ASAP with a search from this Notice. * I understand that this entry could be selected the winner in the Special Early Look Prize Event from PCH Gwy No 8800.
it will be nice to win on dec22 so i can buy a home for the holidays for my family. and buy my husband a truck. that what i will do if i win the big one on dec 22. I WANT TO CLAIM A PRIZE NUMBER ON THE WINNERS SELECTION LIST. THIS IS MY FINAL STEP TO SECURE FULL ELIGIBILITY TO WIN PCH GWY NO 8800 TURN BACK TIME PRIZE. $2.6 MILLION PLUS $5,000.00 A WEEK FOR LIFE. THANK YOU. PLEASE CONFIRM MY FINAL STEP #8800 FOR $2.6 MILLION. THANKS FOR THIS CHANCE TO WIN. I want to win PCHSearch&Win $2.6 Million Plus More GWY No8800 on December 22nd for the welfare of my family , to buy a Dream Brand New Car , A Dream House , Health and Education of my family members and investment in Stocks , Real Estate and Gold ! Hello dearest PCH please l’m searching to win this $50,000.00 cash prize award . Thanks dear. I Prisicella fayne wants to win pch lotto dec.22nd plus $2.6. Million plus more $5,000 a week for life & gwy.no9215& $10,000.00& gwy.10074 & 8954 8970 8955 8957 89t9 i want to win the turnback time 10 years of giveaway prize & title. Transfer of funds to p. Fayne win it all pch search& win. Play& win pxh frontpage games all prizes at stakes pch # 8800. Pch $100,000.00 8035 & 8186 pch app. I want to win it all i really want to win the lotto. $2,600,000.00 is a lot of doe. If I could I would make a cake out of it. But I can’t so I’ll just have to spend and share it. Your financial situation may be about to improve because funds in the amount of $2,6OO,OOO.OO At Once, Plus $5,OOO.OO A Week For Life could be awarded to you on December 22nd! Your action is required to take advantage of this opportunity to qualify for successful transfer of funds as shown below. $2,6OO,OOO.OO At Once, Plus $5,OOO.OO A Week For Life — Prize Patrol Prepared to Commence Payments on December 22nd. Make no mistake, you must act before the 12/2/17 (11:59 PM, ET) deadline for the chance to collect full “Turn Back Time” Prize payments from your forthcoming prize number should it match the winning number on drawing day when we’ll take a special early look for a winner. Please note, if there’s no match to the winning number, an alternate winner will be selected to receive a base prize instead. It’s your fate that’s possibly on the line. So don’t hesitate! Immediate and permanent forfeiture of your forthcoming Prize Number’s eligibility to soon win for you will occur as of the entry deadline, so don’t delay! No extensions or exceptions will be made and that’s absolutely final. RESPOND AT ONCE, Mr. Appel, or risk losing out on this opportunity forever. Yes I really want to win the $2.5 Million plus more. Thank You PCH! PCH and Staff, I have never won anything in my life and with my chances to win from GWY. 8800, it would help me to live my life lot better. Also be able to the things I like, take a vacation, get a new car, purchase a home of my own. So I will pray that I win something from your contests. Aught < just go ahead and enter me in Win $6.2 million Plus more contest Thanks . I want to win it all. 2.6 million 5,000 a wee for life. PCH gwy #8800 $2,600,000.00, plus $5,000.00 a week for life prize. Turn back time prize, for the past 10 years $2,600,000.00, all at once. I want to win this prize, 12/22/17, that is 10 years of win for life payment. 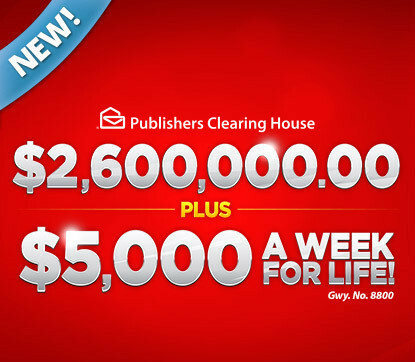 PCH gwy #8800, $2,600,000.00, plus $5,000.00 a week for life and win $50,000.00 bonus gwy #3726. This is for the final goal seal and special early look. I want to win this prize. 12/22/17. I am sending this again to make sure it arrive. PCH gwy #8800, $2,600,000.00, plus $5,000.00 a week for life and win $50,000.00 bonus gwy #3726. This is for the final goal seal and special early look. I want to win this prize. 12/22/17. PCH GWY. 8800 LIFEtime PRIZE. $2.6 MILLION PLUS More HWY 8800′ 5,000 rest of your life. PCH FRONTPAGE PLEASE ENTER ME TOO WIN $2.6 MILLION PLUS $5,000.00 A WEEK FROM PCH Gwy No.8800 on Dec.22nd! Yes I want to win the $2.6 Million plus more on Dec. 22nd. Thank You PCH! I very much need to win 8800, 2.6 million plus more. I receive this prize in JESUS OF NAZARETH NAME. SEE YA DEC 22.TY AND MOST OF ALL PRAISE GOD. Hello dear PCH please I really appreciate and thank you for everything you guys are doing. Please Dear l love to win this prize award $2.6 Million plus $5,000.00 a week for life Gwy no 8800 on December 22nd. Thanks PCH May God continue to bless you guys for me. And keep you guys safe. Thanks again. yes i want to claim the gwy 8800 on dec 22 so i can buy a new home and a truck that will be a big christmas gift for my family only me,husband and two great good kids i got they are the best. and my husband too that what i will do if i win the big one on dec 22. Good morning dear PCH love would love to accept a prize number fully valid to win this prize 2.6 million plus $5,000.00 a week for life Gwy no 8800 on December 22nd. Please PCH l really want to win this prize award. Thanks PCH. I really appreciate everything. I have been playing every day with publishers clearing house since 2003 and, I have yet to receive anything. I WANT TO CLAIM MY PENDING ENTRY AND MY PRIZE NUMBER FOR $2.6 MILLION PLUS MORE. PCH gwy #8800 $2,600,000.00 plus $5,000.00 a week for life. Forfeit or Claim, I am in this to Claim $2,600,000.00 plus $5,000.00 a week for life 12/22/17. I want to win . I, KARON THOREN will accept definitive ownership of the forthcoming Prize Number to be assigned to me upon a timely search. In acceptance of this ownership, I understand that I would receive a prize associated with the Prize Number should I be selected the winner on December 22nd in this special early look event from PCH Giveaway No. : 8800. Yes, I want to WIN the “TURN BACK TIME” Prize Event for the $2.6 Million Up Front Plus $5,000.00 A Week For Life on December 22nd! from PCH Giveaway No. : 8800. Yes, I sure want to WIN this BIG Prize Event on December 22nd! I sincerely hope and pray to win. All Glory and Honor to you and I sincerely hope and pray to win……..
be awarded on Dec, 22nd. It would be a miracle blessing to win the $2,600,000.00 plus $5,500.00 per week for life. It not only helping myself & family but to help others that are in need. It’s a wonderful feeling to have an opportunity to help others. Hello dear PCH l’m searching at PCHFrontpage to claim a prize number to be come fully eligibile to win this $2.6 Million plus $5,000.00 a week for life Gwy no 8800 on December 22nd. During this special early look even. Thanks PCH I appreciate you guys. God bless. On top if helping my family and others, I might open my own deli business. Enter $2.6 Million Plus $5,000.00 A Week Forever from PCH Gwy No.8800 on Dec.22nd! PCH I am Activating my entries to win sweepstakes Gwy $2.6 Million plus $5,000.00 a week for life so Prize Patrol come to my House in Old Hickory!! Happy Holidays to all of you!! Thank You! Final Step. PCH FrontPage Search & Win. Please activate two entries to win from this Notice. I claim $2.6 Million all at once plus $5.000.00 a week for Life from PCH Gwy N 8800, over 500 winners , I am one of them. But I want to win the Biggest award., I hope to see in just week with a flowers, and the big ckeck deliver to Prize Patrol in my hands on December 22nd during this Special Early Look Prize Event. Thanks I see as soon.!! Hello Good morning dear PCH. I’m searching for a fully eligibile forthcoming prize number to win this $2.6 Million plus $5,000.00 a week for life Gwy no 8800 on December 22nd. Thanks PCH for the opportunity.God bless you guys. I Would Love to WIN 2.6 Million Plus More to Pay My Mortgage Off and Find A New House PCH. PCH I Am Claiming My 2x Entries for Turn Back Time on Dec 22nd. PCH Activate My 2x Entries for Turn Back Time the 2.6 Million Plus More. PCH Please Activate My 2x Entries for Turn Back Time the 2.6 Million Plus More. I Would Be Shocked If I Was Your Winner. Please Pray for Me On Monday Undergoing Surgery at Foxchase Cancer Ctr in Philadelphia. This is one time I wouldn’t mind my ship coming in. In fact if it came in, I just might pay my way to go on it to go back just for the ride. I would also take my family with me. I WOULD LOVE TO WIN $2.6 MILLION PLUS $5,000.00 A WEEK FOR LIFE. THANK YOU. Roy, take the final step to enter to win from this notice, ACT NOW! Drive to Appel residence at 9318 Vista Cir to deliver the big check should you win! Roy Appel, take the FINAL STEP! Enter promptly, and a prize of $2.6 Million All At Once PLUS $5,OOO.OO A Week For Life (PCH Gwy. No. 88OO) could be in your hands before you know it. Now that you can see we’d know where to go if you become a winner of this December 22nd Special Early Look Prize Event, nothing should be stopping you from acting now to secure TWO Entries to win.